BACKGROUND: Bladder cancer (BCa) is the ninth most common cancer accounting for 3.9% of all cancer cases as per the Indian Cancer Registry data. There is a scarcity of data on urinary Bca from India. AIM: The aim of this study was to know demographic background, stage distribution, utilization of various treatment modalities, and oncological outcome in Indian patients presenting with bladder cancer to a tertiary care cancer center in Mumbai. METHODOLOGY: We performed a retrospective audit of all patients registered as urinary BCa in our hospital from January 1, 2013 to December 31, 2013. Electronic medical records of these patients were checked for most of the information gathered. RESULTS: Median age of patients at presentation was 59 years with a range of 18–88 years. There were 84% male and 16% female patients. Forty seven percent of patients had nonmuscle invasive bladder cancer (NMIBC), 36% had muscle invasive bladder cancer and locally advanced disease, and 17% had metastatic disease. Eight patients were treated with trimodality bladder preservation protocol. Recurrence was seen in 38 (22.6%) patients with NMIBC. Out of them. 44.7% and 55.3% were in low- and high-grade tumors, respectively. Overall survival and disease-free survival estimated for 3 years were 63% and 57%, respectively. CONCLUSION: Bladder cancer has a varied spectrum of presentation. Bladder cancer patients presenting to our hospital generally have a higher stage and grade of disease compared with that in the west. Urinary bladder cancer (BCa) is one of the most common urological malignancies. It accounts for 3.9% of all cancer cases in men. It is the second most common urological cancer among patients presenting to Uro-oncology Disease Management Group at our hospital. Increasing use of tobacco and increasing risk of exposure to industrial chemicals are the likely causes for BCa. There is a scarcity of Indian data on BCa. This study aimed to know demographic background, stage distribution, utilization of various treatment modalities, and oncological outcome in patients presenting with BCa to a tertiary care cancer center in Mumbai. The study was conducted in a tertiary care oncology center. All patients diagnosed with cancer, after an initial evaluation and workup, are discussed in a multidisciplinary joint committee (JC) consisting of surgical, medical, and radiation oncologists; radiologists; and pathologists before a treatment is planned. We performed a retrospective audit of all patients registered as urinary bladder cancer (BCa) in our hospital from January 1, 2013 to December 31, 2013. Data were collected from electronic medical records (EMRs) of these patients. 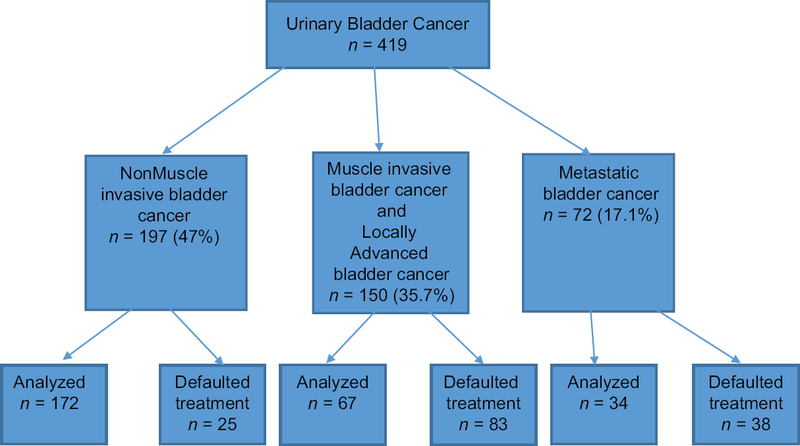 Nonmuscle invasive bladder cancer (NMIBC) and muscle invasive bladder cancer (MIBC) were analyzed separately. Patients who were lost to follow up were contacted telephonically. Kaplan–Meir analysis was done to estimate survival. Log-rank test of comparison was applied to estimate the difference in the survival among the different stages of BCa. SPSS version 24 was used for analysis. From January to December 2013, 419 patients were registered at Tata Memorial Hospital (TMH) as BCa. Median age of patients at presentation was 59 years with a range of 18–88 years. There were 84% males and 16% female patients. They were broadly classified into four categories – NMIBC and MIBC, which includes locally advanced disease and metastatic or advanced bladder cancer (ABC). [Figure 1] depicts the stage distribution of patients at presentation. In total 197 patients were registered as NMIBC. Of these four patients were found to have non-urothelial cancers, eleven MIBC and in three patients no cancers were detected. 25 patients were lost to follow up after registration/ initial evaluation. Thus 43 patients were excluded from the final analysis. The data of the remaining 154 patients were included in the final analysis. Of these 154 patients, 70 patients had undergone Transurethral resection of bladder tumors (TURBT) at another hospital. Later they came to TMH for further management. Of the remaining 84 patients, 22 patients were treatment naive. They had undergone their first TURBT at our institute. 62 patients had undergone TURBT elsewhere and underwent a TURBT for residual disease at our institute. The most common symptom at presentation was hematuria in 83.6%patients, followed by lower urinary tract symptoms, which were primarily storage symptoms. We had 68 papillary and 16 solid tumors. Forty four patients had single tumor, 30 had multiple tumors, up to three tumors, and 10 had more than three tumors. Most common site of tumor was on posterolateral walls. Twelve patients required double J stenting after resection. Blood loss was minimal but not quantifiable. Average length of stay in hospital was 2 days. As a departmental policy, almost all indicated patients received 40 mg of intravesical Mitomycin C within 6–8 h of resection. Six patients did not receive Mitomycin C because of bleeding and perforation. Four patients underwent cystoscopy for continued bleeding or clots after TURBT. There were two inadvertent micro perforations during resection. Both were managed conservatively. No patient required exploration for perforation. [Table 1] depicts the distribution of patient's post-TURBT based of final histopathology report (HPR). Of the 154 urothelial NMIBCs, there were 47 low-, 21 intermediate-, and 86 high-risk NMIBC based on final histopathology and prior resections. Eleven (6.5%) patients were found to be MIBC. Out of these, seven underwent radical cystectomy (RC). On a median follow-up of 42 months, 28 patients with NMIBC were lost to follow up. 126 patients have been on regular follow-up undergoing cystoscopy and urine cytology based on their risk stratification. The average number of cystoscopies done in patients with low-, intermediate-, and high-risk tumors over a period of 42 months was 7, 14, and 16, respectively. The average number of urine cytology done in intermediate- and high-risk tumors was 13 and 16, respectively. Among 154 NMBIC, none of the patients had obstructive uropathy. Among 67 patients with MIBC, 21 (31.3%) had obstructive uropathy. Seven required diversion with percutaneous nephrostomy/DJ stent placement. Fourteen were managed with early RC. They had a creatinine range from 1.6 to 4.7 mg/dL. Among 107 intermediate- and high-risk patients, intravesical BCG was started in 97 patients. Majority (89%) of these were of high-risk category. Only 22% of patients could complete 3 years of BCG, whereas 64% could complete 1 year. Frequency and dysuria were the most common symptoms. Five patients required antitubercular treatment because of systemic toxicity, such as fever or radiological signs of tuberculosis. Recurrence rate in patients with low-, intermediate-, and high-risk tumors were 29%, 18%, and 41%, respectively. There were 150 patients diagnosed with MIBC in the year 2013. This included patients with a histopathological and radiological confirmation of muscle invasive or locally advanced (T3, N+) disease. 67 (44.66%) of them underwent some form of definitive treatment at our hospital. Among the patients who underwent definitive treatment, 59 (86.5%) underwent RC with pelvic lymph node dissection (PLND) and 8 patients (13.5%) underwent definitive Chemoradiation. Postcystectomy stage wise distribution of disease was as follows: 5 patients (8%) were stage I, 38 (56.7%) were stage II, and 24 (35.8%) were stage III. In total, 83 patients defaulted during various stages of evaluation and while waiting for treatment. There were 59 RCs done during the study period. There were 50 males and 9 females among those who underwent RC. Six patients had been given neoadjuvant chemotherapy. Three received Gemcitabine and Cisplatin, whereas three received Gemcitabine and carboplatin. Fifty-three patients underwent an ileal conduit and six patients had a neobladder for urinary diversion. All RCs were by open route. Mean blood loss during RC was 1,450 mL (200–4,500 mL). The most common complication following RC was bowel-related and surgical site infection (six patients each). [Table 2] depicts the postoperative complications. There was one patient with perioperative 30-day mortality. Thirty patients received adjuvant chemotherapy based on their final histopathology. At a median follow-up of 41 months, estimated 5-year overall survival (OS) and disease-free survival (DFS) in patients who had RC with PLND was 63% and 57%, respectively. Seven patients had local and eight had distant recurrence. Eight patients were treated with trimodality bladder preservation protocol (seven males, one female). Median age was 62.5 years. Six patients had pre-existing comorbidities (two with previous cerebrovascular accident, two with hypertension, one with hepatitis C, and one with interstitial lung disease). All patients had a high-grade tumor with stage T2N0M0 except one who had T4N3M0 disease. Three patients had received neoadjuvant chemotherapy with combination of gemcitabine and carboplatin. After a maximal TURBT in all the patients, radiotherapy was delivered to the entire pelvis to a dose of 50 Gy in 25 fractions for all the patients. Whole bladder received a dose of 59.4 to 64 Gy and 2 patients received a partial bladder boost up to a total dose of 68 Gy. Acute gastrointestinal toxicity was observed in three patients (grade I in two patients, grade II in one patient), and acute genitourinary toxicity in five patients (grade I in three patients, grade II in three patients). No grade III/IV acute toxicities were observed. On follow-up, grade III late gastrointestinal toxicity was observed in one patient, and grade I/II late genitourinary toxicity in two patients. Three patients were lost to follow-up within 6 months of CTRT, of which one patient showed unresectable residual disease (T4N3) at first follow-up. Remaining five patients did not show any relapses over follow-up period. Till the last follow-up, four patients were alive and disease free after >3 years from diagnosis. One patient died of unknown cause at 8 months after radiotherapy. Out of 72 patients with metastatic disease at presentation, 34 (47.22%) were managed at our hospital. The most common metastatic sites were nonregional lymph nodes (13 patients), bone (13 patients), lung (12 patients), liver (9 patients), pelvic peritoneum (3 patients), and adrenal (2 patients). Twelve patients had more than one site of metastases; 19 patients (55.8%) underwent palliative chemotherapy; 15 patients (44%) were not fit for any form of chemotherapy and were given best supportive care; and 8 patients (23.5%) had received palliative radiotherapy to the symptomatic bone metastases. BCa has a wide spectrum of presentation with indolent low-grade NMIBC at one end and aggressive MIBC on the other. In this series, we have tried to capture this spectrum on a 1-year time line with their follow-up. Less than half of BCa patients (47%) that present to us are NMIBC. This is much lesser than that in the western countries where three-fourth patients are NMIBC. Within NMIBC only 32% are low grade. Within MIBC, almost one-third are locally advanced. So, overall, our patients present with higher stage and grade of this disease. Males are predominantly affected. However, among females, this disease is most likely to have aggressive/muscle invasive disease. Of the 419 BCa patients registered with us, one-third of patients did not receive treatment with us. Among those who defaulted in the initial phase most had locally advanced or metastatic disease. This is a trend often seen in developing nations where a structured referral system is not available and patients often flip-flop between oncologists, non-oncology physicians, and their family doctor and hence end up being treated by multiple physicians. Long wait list for investigations and surgery at our hospital and lack of logistical support at a new city could also be responsible for the default rate. NMIBC is the most common presentation of bladder cancer. Survival and prognosis of patients is affected by multiple factors such as age, gender, and environment in addition to tumor biology. Men in our series were affected eight times more than females; however, females had more aggressive disease. This ratio was more skewed toward males compared with western data, which report men being affected four times more often than women. Women are more often diagnosed with a higher tumor grade and stage than men. The most common symptom at presentation was hematuria, 159 (83.6%), followed by irritable UB symptoms, 21 (11.05%), which is a finding no different from other reports. Forty seven percent of our patients had NMIBC, 36% had MIBC and locally advanced disease, and 17% had metastatic disease. Compared with the western literature where 70% patients at presentation have NMIBC, >50% of our patients present with muscle invasive or higher stage. Further, within NMIBC also, we have a greater proportion of T1 tumors (44%) compared with Ta which is reported to be around 20% in other series. As per risk stratification, also 55.3% had high risk NMIBC. Eleven (6.5%) patients were found to be muscle invasive of final histopathology. We had hardly any patients with isolated carcinoma in situ, which is reported in about 10% patients of NMIBC. In our study, squamous cell and adenocarcinoma were found in one patient each, rest were UCC. These were less than that reported in literature (3%–5% squamous cell carcinoma and 1% adenocarcinoma). Forty five (26.62%) patients resected elsewhere had residual tumor. TURBT of residual tumor was performed. There were downgrading of lesion in 12 (26.6%) patients, stage remained same in 30 (66.66%) patients, and 3 (6.66%) patients had upstaging of disease after TURBT of residual tumor. Twelve patients required double J stenting after resection; however, studies have shown that DJ stenting is not required as resection of ureteral orifices does not affect renal function until involved by tumor. Over the years, we have given up the practice of prophylactically stenting ureters. We place double J stents only if there is an absence of urine efflux after resection/charring of orifice after TURBT or if patient develops symptoms post-TURBT. We found absent detrusor in seven patients whose initial resection took place elsewhere. Five (71.42%) patients had residual tumor on re-TURBT, and in two (28.57%) patients, no tumor found in final HPR. In 2013, we were not performing restaging TURBT for all T1 high-grade tumors in which detrusor was included in initial resection, however, that is now being followed at our hospital. Based on encouraging results of a meta-analysis all patients (except those with microperforation) at our hospital receive perioperative Mitomycin C.
BCG vaccine remains the most powerful drug among the local therapies in NMIBC ever since it was first described by Morales in 1976. It was offered to all our patients in high-risk and intermediate-risk category. Based on the results of EORTC trial, we give induction doses to all patients in intermediate- and high-risk group, 1 year of maintenance to intermediate-risk group and at least 2 years of maintenance to high-risk group. A study done by Van der Meijden et al. on BCG toxicity showed that majority of local and systemic side effects occur during the induction and the first half-year of maintenance BCG. About 20.3% of patient stopped BCG within 1 year due to BCG side effects and 4.7% of patients develop BCG sepsis. We had similar discontinuation rates. Recurrence was seen in 52 (33.7%) patients with NMIBC. 29% in low-risk, 18% in intermediate-risk, and 41% in high-risk tumors, respectively. Based on surveillance protocols suggested by European Association of Urology guidelines, the average number of cystoscopies done in patients with low-, intermediate-, and high-risk tumors was 7, 14, and 16, respectively, and average number of urine cytologies done in intermediate- and high-risk tumors was 13 and 16, respectively. There is a need for studies to evaluate if both cystoscopy and urine cytology are required in every visit of intermediate- and high-risk NMIBC patients. Majority of our patients underwent an ileal conduit following cystectomy. Trend of type of diversion often varies with institutional policies. We counsel all eligible patients for neobladder. Only highly motivated patients with supportive relatives who are ready to perform self-catheterization and understand likely complications of neobladder are selected for this procedure. Only half of our patients received chemotherapy (neoadjuvant or adjuvant). As a policy, we consider all T3 or node-positive patients for chemotherapy. Poor performance status and compromised renal function due to obstructive uropathy are the two major reasons why all patients with MIBC are unable to receive chemotherapy. Over the years, there has been a trend toward greater utilization of Cisplatin-based neoadjuvant chemotherapy at our institution. Our OS and DFS estimated for 3 years was 63% and 57%, respectively. This was slightly inferior to that reported in another large Indian series by Gupta et al. They found a DFS of 66% and OS of 62% at 5 years. Our survival rates of cystectomy patients were also inferior to those reported in western literature., Wound-related complications were most common (16.9%) followed by those related to ureteric and bowel anastomosis (both 11%). Our complications were higher compared with another large Indian series reported by Kulkarni et al., who had <10% wound and anastomosis-related complications. A major limitation of our study was that restaging TURBT was not routinely practiced at our center in 2013. This could have been the reason for higher recurrence rates following intravesical BCG therapy. Higher toxicity and hence higher discontinuation rates could also be contributing to poorer outcome in these patients. However, since 2015, we have been routinely performing restaging TURBT as suggested in international guidelines. In 2013, only eight patients with MIBC were treated with radiation; however, over the last 4 years, the technique and utilization of bladder preservation has evolved and is now used much more frequently at our hospital. The 3-year DFS and OS in a series of 44 patients who underwent bladder preservation at our hospital was 66% and 67%, respectively. BCa has a varied spectrum of presentation. BCa patients presenting to our hospital generally have a higher stage and grade of disease compared with that in the west. Rohit Dussane, Statistician, CSR Dept. Tata Memorial Hospital. We would like to acknowledge that Dr Sheetal Kulkarni has made substantial contributions in drafting and revising this paper. Yeole BB, Kurkure AP, Koyande SS. Geographic variation in cancer incidence and its patterns in urban Maharashtra, 2001. Asian Pac J Cancer Prev 2006;7:385-90. Cumberbatch MG, Cox A, Teare D, Catto JW. Contemporary occupational carcinogen exposure and bladder cancer: A systematic review and meta-analysis. JAMA Oncol 2015;1:1282-90. Babjuk M, Oosterlinck W, Sylvester R, Kaasinen E, Böhle A, Palou-Redorta J, et al. EAU guidelines on non-muscle-invasive urothelial carcinoma of the bladder, the 2011 update. Actas Urol Esp 2012;36:389-402. Madeb R, Messing EM. Gender, racial and age differences in bladder cancer incidence and mortality. Urol Oncol 2004;22:86-92. Gunlusoy B, Ceylan Y, Degirmenci T, Kozacioglu Z, Yonguc T, Bozkurt H, et al. Urothelial bladder cancer in young adults: Diagnosis, treatment and clinical behaviour. Can Urol Assoc J 2015;9:E727-30. Lucca I, Klatte T, Fajkovic H, de Martino M, Shariat SF. Gender differences in incidence and outcomes of urothelial and kidney cancer. Nat Rev Urol 2015;12:585-92. Varkarakis MJ, Gaeta J, Moore RH, Murphy GP. Superficial bladder tumor. Aspects of clinical progression. Urology 1974;4:414-20. Lutzeyer W, Rübben H, Dahm H. Prognostic parameters in superficial bladder cancer: An analysis of 315 cases. J Urol 1982;127:250-2. Ro JY, Staerkel GA, Ayala AG. Cytologic and histologic features of superficial bladder cancer. Urol Clin North Am 1992;19:435-53. Wu X, Ros MM, Gu J, Kiemeney L. Epidemiology and genetic susceptibility to bladder cancer. BJU Int 2008;102:1207-15. Mano R, Shoshany O, Baniel J, Yossepowitch O. Resection of ureteral orifice during transurethral resection of bladder tumor: Functional and oncologic implications. J Urol 2012;188:2129-33. Herr HW. The value of a second transurethral resection in evaluating patients with bladder tumors. J Urol 1999;162:74-6. Shim JS, Choi H, Noh TI, Tae JH, Yoon SG, Kang SH, et al. The clinical significance of a second transurethral resection for T1 high-grade bladder cancer: Results of a prospective study. Korean J Urol 2015;56:429-34. Morales A, Eidinger D, Bruce AW. Intracavitary Bacillus Calmette-Guerin in the treatment of superficial bladder tumors. J Urol 1976;116:180-3. Brausi M, Oddens J, Sylvester R, Bono A, van de Beek C, van Andel G, et al. Side effects of Bacillus Calmette-Guérin (BCG) in the treatment of intermediate- and high-risk Ta, T1 papillary carcinoma of the bladder: Results of the EORTC genito-urinary cancers group randomised phase 3 study comparing one-third dose with full dose and 1 year with 3 years of maintenance BCG. Eur Urol 2014;65:69-76. Van der Meijden AP, Sylvester RJ, Oosterlinck W, Hoeltl W, Bono AV. EORTC Genito-Urinary Tract Cancer Group. Maintenance Bacillus Calmette-Guerin for Ta T1 bladder tumors is not associated with increased toxicity: Results from a European Organisation for Research and Treatment of Cancer Genito-Urinary Group Phase III Trial. Eur Urol 2003;44:429-34. Kumar A, Dubey D, Bansal P, Mandhani A, Naik S. Urinary interleukin-8 predicts the response of standard and low dose intravesical bacillus Calmette-Guerin (modified Danish 1331 strain) for superficial bladder cancer. J Urol 2002;168:2232-5. Agrawal MS, Agrawal M, Bansal S, Agarwal M, Lavania P, Goyal J. The safety and efficacy of different doses of bacillus Calmette Guérin in superficial bladder transitional cell carcinoma. Urology 2007;70:1075-8. Gupta NP, Kolla SB, Seth A, Dogra PN, Hemal AK, Kumar R, et al. Radical cystectomy for bladder cancer: A single center experience. Indian J Urol 2008;24:54-9. Stein JP, Lieskovsky G, Cote R, Groshen S, Feng AC, Boyd S, et al. Radical cystectomy in the treatment of invasive bladder cancer: Long-term results in 1,054 patients. J Clin Oncol 2001;19:666-75. Dalbagni G, Genega E, Hashibe M, Zhang ZF, Russo P, Herr H, et al. Cystectomy for bladder cancer: A contemporary series. J Urol 2001;165:1111-6. Kulkarni JN. Perioperative morbidity of radical cystectomy: A review. Indian J Urol 2011;27:226-32. Murthy V, Masodkar R, Kalyani N, Mahantshetty U, Bakshi G, Prakash G, et al. clinical outcomes with dose-escalated adaptive radiation therapy for urinary bladder cancer: A prospective study. Int J Radiat Oncol Biol Phys 2016;94:60-66.